How could Papa John’s have better managed this PR crisis? Mark Macias: It’s typically harder to manage the actions of founders when it comes to PR. It’s their company and when they’re successful, founders learn to trust their own instinct and approach over others. As for preventing this, I don’t think anyone could have controlled Schnatter. He was outspoken with the NFL and ran his mouth without concern for how his opinions could be viewed by others from different backgrounds. He was probably like that in the 7th grade, so no one is changing him. I think if anything he is more prone to repeating this crisis in the future. 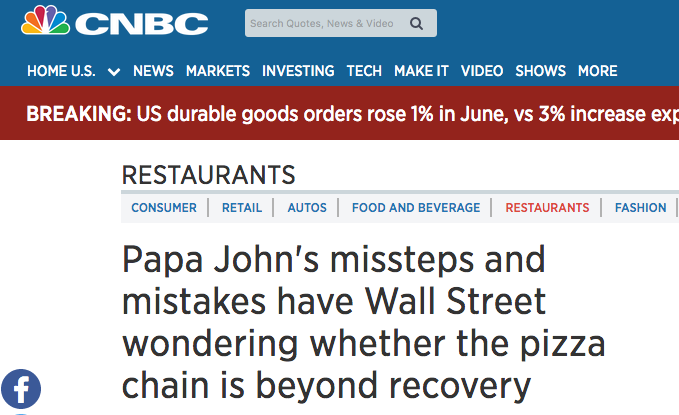 CNBC: Could Papa John’s have been better prepared? Mark Macias: The board and executive suite knows Schnatter better than anyone. I’m sure they were aware of his actions and temperaments. More than likely, they didn’t want to press his buttons, especially if the company was growing financially. This could have been better managed from the start – and thus better prepared – had the board hired an outside crisis firm with experience. Not a creative services firm. There is a big difference between the two. A creative services firm is great for getting your company name out but a crisis requires a completely different strategy and approach to managing the message. An outside crisis firm could also have seen the personality concerns with Schnatter and addressed them – hopefully in a candid way. If you were to advise Papa John’s, what would you have them do next? Mark Macias: First off, put creativity aside and focus on the message. Go to the roots. Who are your customers – and make sure your board and franchisees reflect them. It’s not about being “PC”. It’s a smart approach that gives your brand an insight into what your customers want. Also, don’t go silent this football season. We are all used to seeing Papa Johns commercials during the games. If anything, use that platform to educate your customers on how you are changing. People love Papa Johns so just give them a safe reason to keep ordering your pies. What would you tell John Schnatter? Mark Macias: Lay low, don’t try to bring on anymore controversy. Let this pass – and don’t create new angles, like you were extorted. You brought this on yourself. Don’t blame the people around you. I’d also remind Schnatter that his views are based on his experiences. He might think he’s right in business but if he doesn’t acknowledge the change around him or the experiences of others, he will be back in the news soon with another crisis. CNBC: Laundry Service? What comes next? Mark Macias: It looks like the next big thing already happened – they fired their CEO, laid off 60 employees and hired a new PR firm to guide them through this crisis. If they’re a really creative firm, they should already be working on a new creative campaign that makes fun of themselves and their association with Papa Johns.